PoliticsHome.com parliamentary editor Tony Grew told ITV News that he saw Eric Joyce "wrestling on the floor with two police officers" before he was arrested following an alleged late-night brawl in a House of Commons bar. Mr Joyce, 52, remains in custody answering police questions about the incident. Eric Joyce MP has been banned from buying alcohol from the Parliamentary estate by the Sergeant at Arms while police investigate a late-night brawl at a bar in the House of Commons, according to Sky News. A photograph appearing to show MP Eric Joyce being surrounded by police following an alleged late-night brawl at a bar in the House of Commons. He was arrested after the incident at the Sports and Social Club bar. Tony Grew, from the PoliticsHome website, witnessed the altercation which he said happened during a karaoke night in the bar, which was packed with about 150 people. He said Mr Joyce entered the room "obviously agitated" and pushed his way forward to the bar. When he followed him out of the bar he saw Mr Joyce on the ground "wrestling with two police officers". There does not appear to be much support for Eric Joyce in his constituency of Falkirk. ITV News' Scotland Correspondent Debi Edward spoke to constituents in Denny and many want to see him resign. One woman said the town is in a bad way and in need of regeneration and he should be dealing with that, while another said he should "do the decent thing" and step down. Asked whether the Prime Minister felt Mr Joyce could continue as an MP, David Cameron's official spokesman told a regular Westminster media briefing: "That is a matter for Mr Joyce." 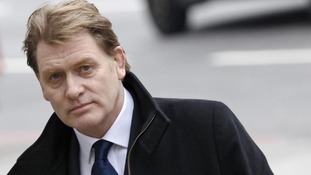 PoliticsHome.com parliamentary editor Tony Grew witnessed Eric Joyce's arrest. He he was at Parliament's sports and social bar for a karaoke night - mostly populated by young aides and researchers - when he saw Mr Joyce enter the bar "obviously agitated." Mr Grew said he then followed the MP outside but by the time he was out of the bar, he saw Joyce "wrestling with two police officers" and "he had one of the officers in an arm lock". "I can vividly remember a policeman's hat rolling on the ground towards me as I was watching," he added. After Joyce was handcuffed, he then saw the MP "on a bench, being held down by three or four police officers - he was still struggling." He was then taken away in a police van. Grew said he spoke to others in the bar who suggested the altercation may have arisen because a member of bar staff had told Mr Joyce that he couldn't take his glass into the outside smoking area. According to an eyewitness who spoke to PoliticsHome.com, Eric Joyce "wrestled with two officers, knocking them to the ground, and one policeman's helmet was removed in the melee." The report says Joyce's involvement followed and altercation between the MPs adviser and a member of staff. Eric Joyce apologises for his "litany of crimes"